This is a shrub about three feet high, which is attractive except for its unpleasant smell. The leaves are smooth, toothless, stiffish and thickish, and bluish-green, with a small bristle at the tip, and mostly with three leaflets. The pretty flowers are nearly an inch across and warm yellow in color, not very bright but pretty in tone, with six very long, yellow stamens, and form a short, oblong cluster. The ovary has such a long stalk, even in the flower, that it gives an odd appearance and it develops into a very curious and conspicuous, drooping pod, an inch and a half long, much inflated and resembling a very fat pea-pod, on a long stalk, with two rows of seeds like little peas inside it, which taste very bitter. This is quite common on southern mesas. The name Bladderpod is also used for Lesquerella, which belongs to the Mustard Family. 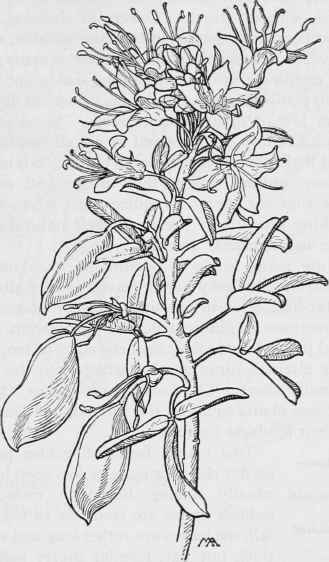 Bladderpod- lsomeris arborea. ORPINE FAMILY. Crassulaceae.